Before the progress report on the Freebird quilt some much needed housekeeping. Caroline from "Contented Caroline" asked me where I got my labels from. They are from this shop. I contacted Anna directly as she didn't have them in her shop at the time and she was so kind to make me some on cotton tape. I got this tip from some other blog but can't really remember from where to be honest. I was last weekend in Germany and gave my mother the 'Laugh and Happiness' quilt with a lot of trepidation in my stomach. But she absolutely loved it. Exactly as all of you knew who so kindly commented with encouragement. So, thank you very much ! Also a lot of people said the quilt reminded them of "Kaffee and Kuchen" (cake and coffee) or cappuccino which my sister echoed too. I never thought about this but now I obviously see cappuccino and cake everywhere when I look at the quilt. I really should have thought about it right away as my Dad is a baker and we have a cafe and bakery. 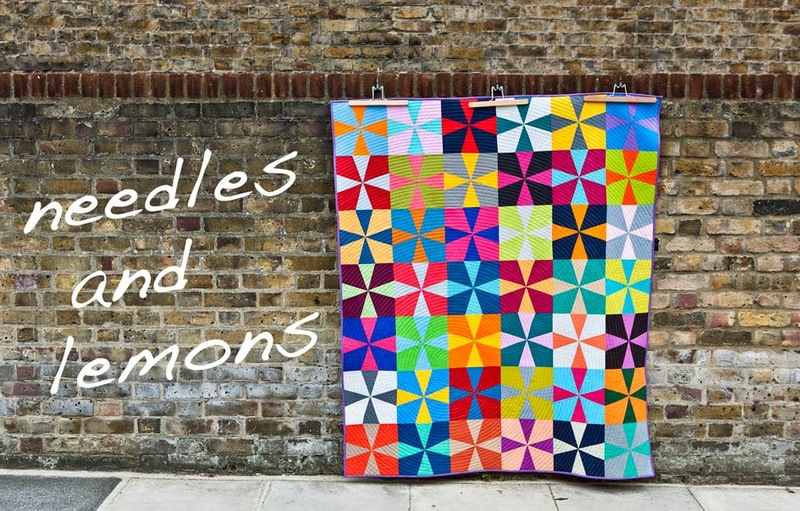 Lastly some of you got very close regarding the Brit Bee blocks I am planning for July. All will be revealed tomorrow. And here is an update on the Freebird progress. Reading your comments to my first post I was rather surprised at how popular the range is. I obviously bought it because I was drawn to the colours but mainly because I wanted to see what I could do with a charm pack. A jelly role of Freebird is still available at Puddleducks and it is on sale if anybody is keen. As you can see I moved forward rather quickly and created a reversible quilt. 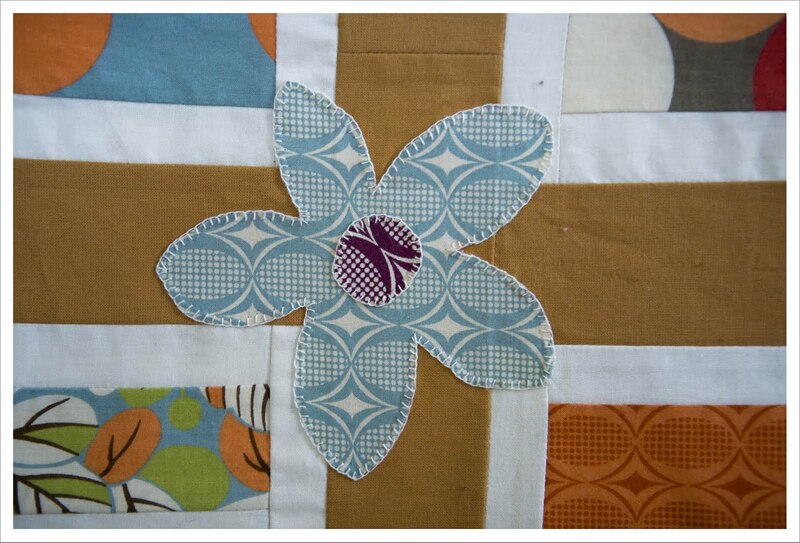 The front is on the right side for which I alternated a full square with one with a piece of Kona white in the middle. Then I added white sashing around them to make the squares stand out against the Caramel background. For the back I used the remainder of the squares for the centre piece and again added white sashing for effect before I added a lovely fresh light green border. I sort of think of the quilt as a two-season quilt. One side represents Spring and the other Autumn. But I still wasn't quite happy with the front and I had a few squares left (I had no idea how long one charm pack lasts) so I added some appliqued flowers to the front to liven it up a bit. Now I'm happy !!! But have no idea how to quilt it with the flowers sticking out ???? Looking forward to tomorrow's post but before that what a great quilt. I like reversible quilts too and have one in progress now.. particularly like the 2 season idea. 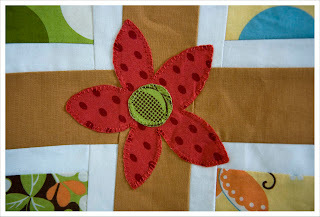 Quilt around the flowers, not over them. 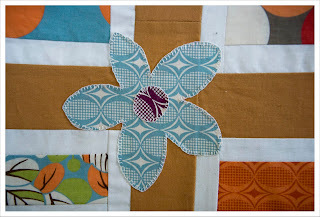 Echo quilting would also look nice around the flowers. Glad your mother likes the quilt. Love your Freebird! Bit nervous about the Bee! !